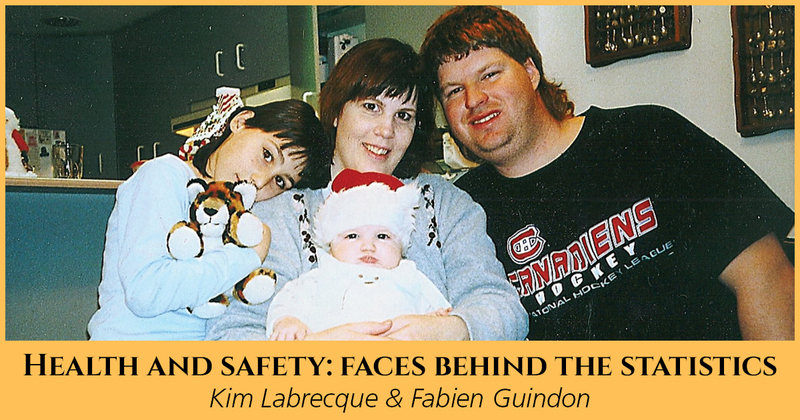 Fabien Guindon died after the trench he was working in collapsed, completely engulfing him. When his wife Kim Labrecque arrived at the hospital and saw an ambulance full of mud, she knew instantly what had happened. As she learned more about how Fabien had died, Kim couldn’t sit back. She channeled her grief into promoting change and helping families like hers cope with their loss. Kim has organized Steps for Life walks in Oka and Montreal, shares her story as a member of the Speakers Bureau, and works directly with other families as a volunteer family guide. Kim has also advocated for regulatory amendments, larger fines for health and safety violations, and for use of those fines to promote health and safety. Read more about Kim and Fabien’s story in Forget Me Not, a Threads of Life book of family stories available at www.threadsoflife.ca/forget-me-not. If you or a loved one have experienced a traumatic workplace fatality or other workplace tragedy, read about how Threads of Life can help you.